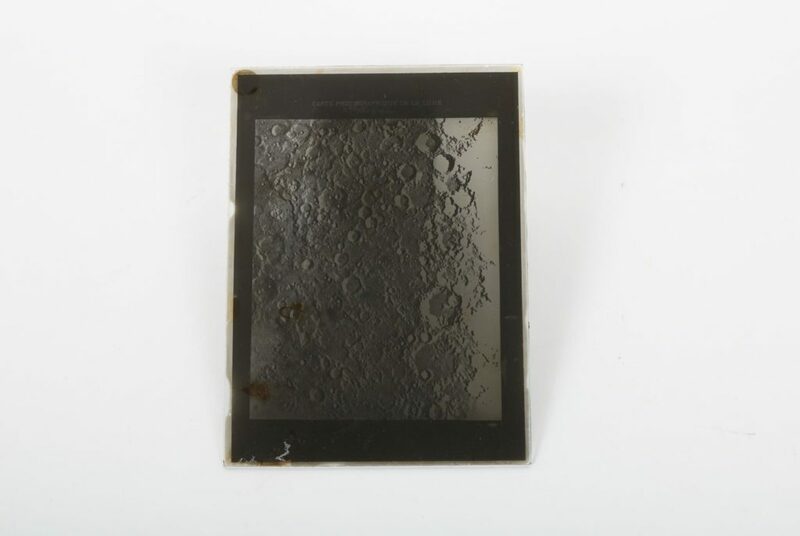 These are a set of thirteen large glass slides showing images of the lunar surface, taken through a telescope. Each slide is 16cm by 12cm, and each appears to be a copy of a page from the photographic book “Carte Photographique de la Lune” which contains photographs of the moon by Charles de Morvan. In addition to the name of the book and the photographer, each slide shows details about the photograph and section of the moon depicted. The slides sit in the base of a cardboard box; the top of the box is missing. Sheets of paper are slipped between each slide. Dimensions (cm): Length= 17, Width = 17.5, Height = 3.2. Good: The slides themselves are in good condition. Around the edges of the slides, the images are born in places. Some of the slides exhibit minor damage, such as scrapes or staining. The paper separating each slide is badly yellowed, folded and in places ripped or stained. The cardboard box is missing the lid and the base is in very poor condition, very worn around the edges, stained along one full side with apparent liquid damage, and ripped along many of the folds. Date of Manufacture: Images: 1890s, Slides: 1930s? It is unknown when these slides were produced, or why. They may be associated with teaching at the Department of Astronomy, or with work done at the David Dunlap Observatory. If the latter, they were likely moved from the David Dunlap Observatory in Richmond Hill in 2008, upon the sale of the observatory. It was stored at the Department of Astronomy and Astrophysics until 2017, when it was moved to a new storage location in McLennan Physical Laboratories.